We've trusted Glyph GT062E storage devices for years and now we have a new line up with the StudioRAID series hard drive for the most crucial audio and video projects. You'll enjoy the blazing fast transfer rates whether you're managing thousands of audio and video files or simply backing up your workstation. 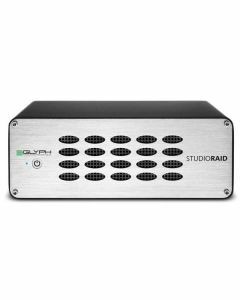 The StudioRAID supports RAID 0 for the fastest transfer rates, and RAID 1 for redundant security. With the StudioRAID hard drive, you've got your choice of USB 3.0, FireWire 800, and eSATA connectivity. The transfer rates are incredible - up to 420 MB/s with USB 3.0. You can edit faster, render more quickly, and work with more tracks at higher sample rates. There's an ultra-quiet fan inside the StudioRAID that ensures proper cooling, with front-panel ventilation to help draw cool air in. Not only does this increase the lifespan of your hard drive, it ensures you won't run into problems due to overheating. The StudioRAID is constantly monitoring its internal components, and will warn you of activity patterns that may indicate a potential drive issue. While Glyph drives are some of the most reliable drives available, and you'll probably never have issues with your StudioRAID, it's nice to know that you'll be notified of potential problems before they cause you to lose valuable data.